SUMMARY: The Sennheiser RS 195 headphones are made for those who are looking for high end, good quality sound, but whose hearing isn’t quite what it used to be. It has features that help individuals with mild to moderate hearing loss listen to audio from televisions and stereos wirelessly. PROS: This system has fantastic sound, is easy to use and is comfortable for most individuals. It has various listening modes so you can customize the sound to your exact preference. We get a lot of questions about what is available to help hear dialog on TV better. There are a decent number of options on the market, one that many people with hearing loss turns to is the Sennheiser RS 195 RF Wireless Headphone System. The RS 195 is a sleek, wireless headset that also contains technology that is designed specifically for individuals with mild to moderate hearing loss. So if you feel like your hearing isn’t as good as it once was, and you find it difficult to hear conversations on TV, this headphone system may be worth considering. The design of the headphones looks like the popular, wireless Bluetooth styles, but they actually use radio frequency(RF) transmission that sends a signal in the 2.4-2.48GHz range. RF is great if you love to wander around your house while you are listening to music or watching TV. The range of the headphones is approximately 100 m or around 300 ft, so you have a lot of flexibility with this style of system. The transmitter also works as a stand, and charging station for the two included rechargeable AAA batteries. Since everyone’s hearing loss is different, this device comes with many different modes to boost or adjust frequency ranges and audio. The transmitter has most of the controls and also functions as the charging dock. There are also multiple sound profiles that boost certain frequency ranges that you change on the transmitter. The volume controls and a power button are on the right ear. LED status indicators on the headphones. 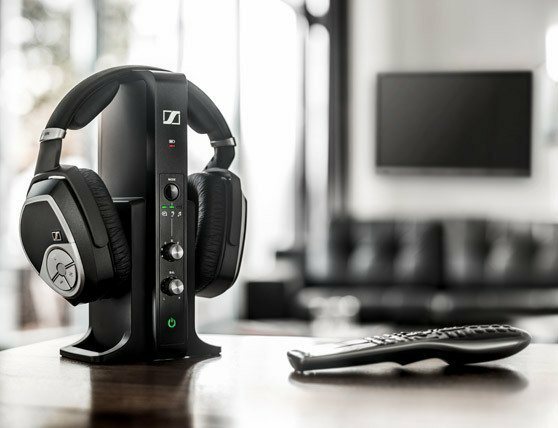 Sennheiser have several headphone listening systems that are made to help those with mild to moderate hearing loss hear dialogue while watching TV. The RS 195 is one of the more recent models that Sennheiser has put out. One of the great things about the Sennheiser assistive listening models is that they allow you to change the settings that enhance speech intelligibility with the push of a button. They also allow you to personalize your hearing settings from one of the seven profiles available. If you have more profound hearing loss, the RS195 isn’t the best option. Also if you like to have really loud headphones, these probably won’t meet your needs, as many reviewers have complained they don’t go loud enough. The headphones are the very popular, large, over the ear style that surrounds and enclose the ears. They have a lot of padding, and most people will find them comfortable, even for long periods. The volume and on/off buttons are located on the headphones, so they are easy to adjust. This headphone style works well to block out ambient noise, but some people find they can get a little bit warm if you are wearing them for extended periods. The RS 195 comes with rechargeable batteries that you put in the headphones. You charge them by placing the headphones on the charger (which is also the stand that you rest the headphones on). It takes approximately 8.5 hours for the batteries to charge fully, although you will need to charge them for 16 hours for their first charge. Each charge will give you up to 18 hours of operating time. The two stand out features of the RS195 for individuals who have hearing loss are the Personal Hearing Profiles and Sound Optimization for Speech. The ability to adjust the profiles is very beneficial for anyone with hearing loss since everyone’s hearing loss is different; it is nice to have the option to fine tune the sound of various devices. The sound optimization also allows you to get a bit of a hearing boost along with additional noise suppression, which can make dialogue much clearer. This TV listening system uses signal-processing strategies for consumer electronics that are based on hearing aid technology. This type of technology works best for those individuals with mild to moderate hearing loss. If you have severe or profound hearing loss, this system is not the best option for you. A lot of users complain that the RS 195 isn’t loud enough, I suspect that their hearing loss is too severe, so they are unable to adjust the settings on the RS 195 for optimal performance. The set up of the Sennheiser 195 couldn’t be smoother. All you need to do is take everything out of the box, add the batteries to the headphones and then plug in the transmitter to the wall. You will then need to charge the headphones on the transmitter (charge for 16 hours for the first charge) and use the appropriate cables and connect the transmitter to your TV setup output. Once the headphones have charged, you can turn everything on, and the device will be ready to use. If you have any trouble, there are also set up tutorials on YouTube. There is no doubt these are one of the more expensive options for TV listening sound systems. As I write this, they are priced in the $400 range. It seems a little high to me for this kind of system, but if you are looking for a wireless headset to help you watch TV or listen to music and you like Sennheiser quality, they may well be worth a shot. Not all systems will work well for everyone, but a lot of people really do like the RS 195. 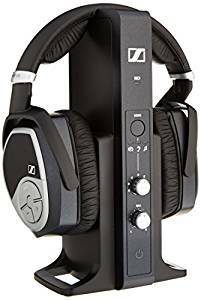 If you would prefer a wireless system that is a little less expensive, you may want to check out the Sennheiser Flex 5000. The RS 195 comes with a 2-year warranty if purchased from an authorized Sennheiser dealer. The RS 195 is designed to help improve speech intelligibility for those with mild to moderate hearing loss, which they do quite well. They are well built, durable and comfortable. It has very good sound quality, and you can personalize it to your hearing requirements. The RS 195 is an excellent option for those who are used to superior sound quality and also need the addition of assistive listening technology added to their TV listening system.